Zoe’s perfect life is about to be ruined by Rion, an extremely annoying alien who insists they are connected for life. What’s Zoe going to do about the Alien? 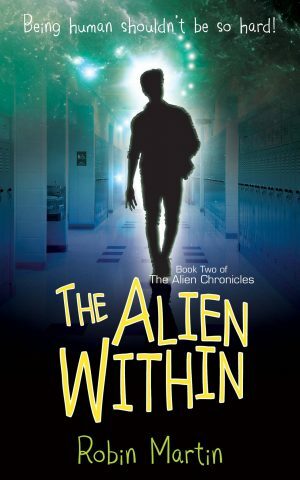 The Alien tells the secret of Orion, an alien boy who desperately wants to be human. 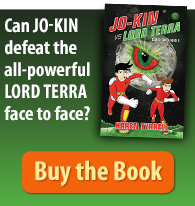 Zoe can’t remember the secret that Rion, the alien boy is hiding. And Rion sure doesn’t want to tell her he’s a 4000-year-old alien. High school romances go haywire after Rion’s Uncle Archimedes comes to school. THINK: Close Encounters meets Mork & Mindy! What motivated you to write The Alien Chronicles series? One night, I scribbled down 3,000 words of what I thought was a short story. The strong voice wouldn’t go away. 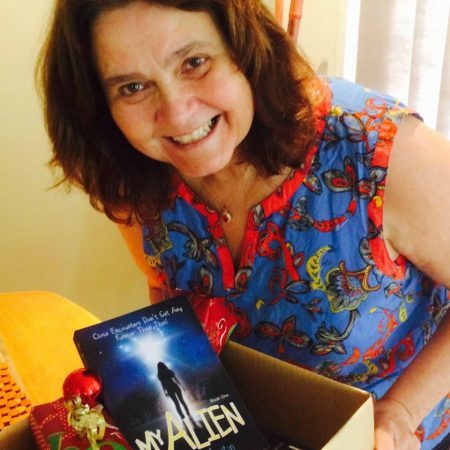 A few months later, I finished the story and before I knew it, I had written ‘My Alien’! How did you get into the mind / point of view of a teenage alien boy? When I was writing about the alien, Orion (or Rion, as Zoe called him), I wanted a character that caused humorous situations and who was a complete contrast to Zoe. He was really smart in some ways, but clueless about how to interact with people. Yet, he tried so hard to fit in – like many teens do. To say I ‘created him’ isn’t quite right – I think he created himself! 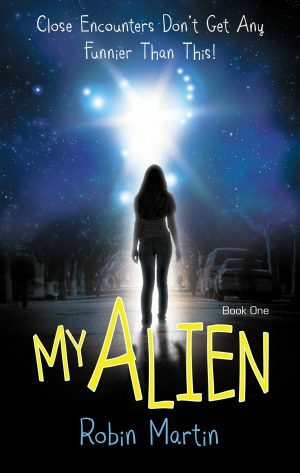 What positive messages for teenagers are woven into The Alien Within story? 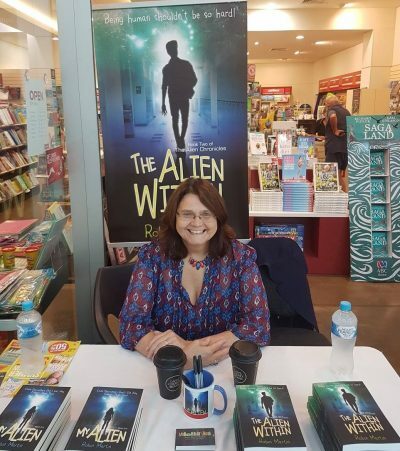 In both the first book, ‘My Alien’, and the second, ‘The Alien Within’, I showed how it was okay to be different. The underlying theme of the series is the alienation that occurs in a lot of children and teens who don’t quite fit the mold. Empathy is vital to understanding that. At times, many of us, particularly teens, feel like aliens in the world. What are three tips for writing a cohesive book series for children? A: I wanted characters that could develop and grow over the course of the books. B: It’s essential to have a theme that links the books. The concept of an alien trying to become human and the problems it created. C: The voice needs to be consistent and the book covers too – for brand identification. 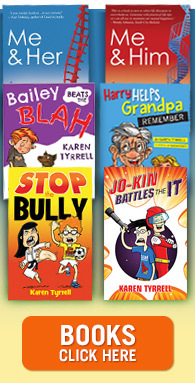 I, Karen Tyrrell agree with all of Robin’s tips on writing a book series. 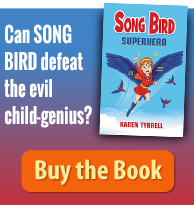 I did this for my Song Bird Series for children. 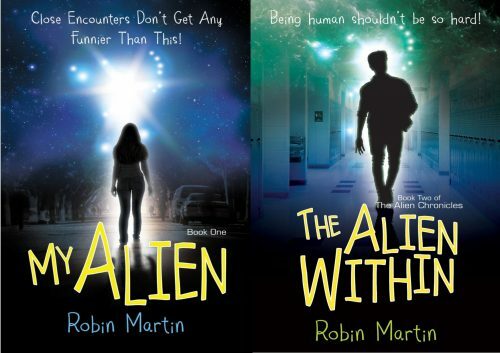 Robin is giving away a twin pack of The Alien Chronicles. If you’d like to win My Alien AND The Alien Within, please leave a comment below. Australian Readers ONLY. The winner is Ruth Garlick. Congratulations! I will be sending your two books out to you soon! Why do you want to win My Alien AND The Alien Within? Hi Karen, I’m excited to be introduced on your blog! I really had fun writing The Alien Chronicles, so I hope readers enjoy it too. I’m also happy to giveaway a copy of each book to the lucky winners today. Good luck, everyone! These sound interesting, and I know what it’s like to be alienated at school. I’d like to be given the opportunity to read them and decide what I think. I’m sure they are wonderful, and I would love to add them to my collection. Thanks for registering in The Alien Chronicles Book Giveaway. Yes, it’s a common problem, Ruth, and I tried to use a little humour and understanding in the book. Thanks for registering for The Alien Chronicles bookgiveaway competition. Congratulations, Ruth! Hope you enjoy my books!